“I never thought about that.” So let me get this straight. You’re thinking all the time, and yet, you never think about how much time you spend thinking. That sounds like an addiction to me. I know, because I’m addicted to thinking too. 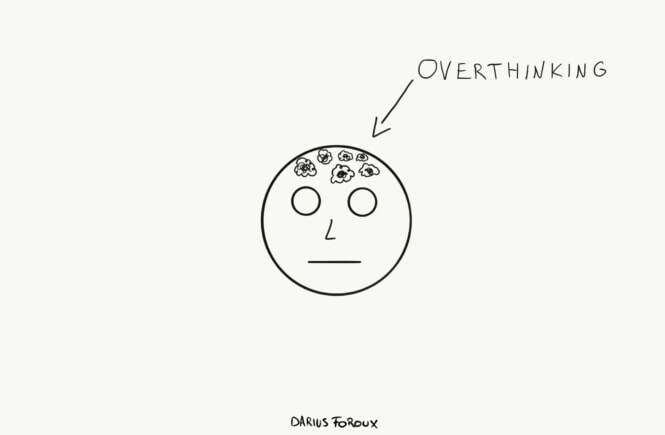 ​But when I think too much, I can’t just say “I’m overthinking.” I need a different approach to unclog my brain. ​When someone says that overthinking is bad, we often assume that only negative thoughts are wrong. And by that definition, it automatically means that positive thoughts are good. How do you live in the present moment?Thinking is a tool. And instead of using that tool during the 16 or 17 hours that you’re awake, only use it when you NEED it. ​That’s not my style. I just can’t fool myself like that. I enjoy the present moment in a different way.